On the Home tab, click the Annotation panel’s label to open its slideout, and then choose Table Style. In the Styles list, select the existing table style whose settings you want to use as the starting point for the settings of the new style. Click the New button to create a new table style that’s a copy of the existing style. Enter a new style name and click Continue. In the Cell Styles area, with Data showing in the list box, specify settings for the data alignment, margins, text, and borders. The settings you’re likely to change are Text Style, Text Height, and perhaps Text Color (all three are on the Text tab) or Grid Color (on the Borders tab). If you leave colors set to ByBlock, the text and grid lines inherit the color that’s current when you create the table. That color will be the current layer’s color. In the Cell Styles area, open the drop-down list and repeat Step 5 for the Headers (that is, the column headings) and the Title styles. Click OK to close the New Table Style dialog box. The new table style becomes the current table style that AutoCAD uses for future tables in this drawing, and the Table Style dialog box closes. Now you’re ready to create a table. 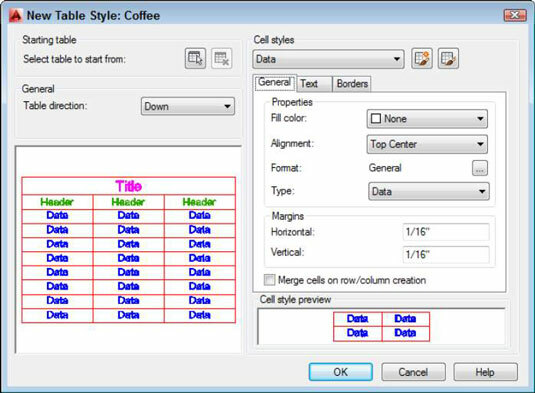 You can access the Manage Cell Styles dialog box directly from the Cell Styles drop-down list of the New Table Style dialog box. The Table Cell Format dialog box (on the General tab, in the Format row, click the ellipsis button) provides a number of additional options for formatting cells by data type. AutoCAD stores table styles in the DWG file, so a style that you create in one drawing isn’t immediately available in others. You can copy a table style from one drawing to another using DesignCenter. (Use the steps for copying layers between drawings, but substitute Tablestyles for Layers.) Table styles can also be defined in drawing template files.